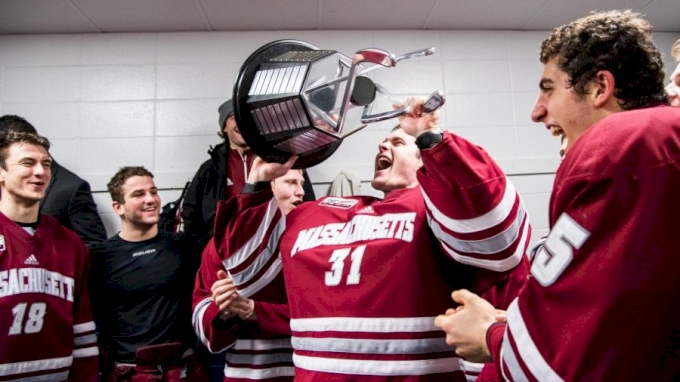 Providence College seemed to have run into one at the worst possible time on Thursday night. The defending NCAA champion Minnesota Duluth will become the first team to appear in three consecutive national title games since Boston College did it from 2006-08 thanks to a 4-1 win over the Friars in the Frozen Four semifinals at KeyBank Center. After something of a Cinderella run in which Nate Leaman’s team ran the gauntlet in the regionals—which were, of course, held in Providence following the team’s shocking early exit in the Hockey East playoffs—the glass slipper finally seemed to shatter when his group simply could not overcome the big, physical play of the Bulldogs with the season on the line. “I thought that was a really good game, kind of the game that we expected,” Leaman said. That bounce came off of fourth line Bulldogs senior winger Billy Exell; Friars goalie Hayden Hawkey was unable to corral a Kobe Roth shot from up top, and Exell stayed with the play and was able to get the puck in the net with 9:53 remaining in regulation for what was ultimately the game-winner. Dylan Samberg and Justin Richards added late empty-net goals for the final margin of victory. At times, the game didn’t feel quite so close as the 1-1 score it was played it through the middle portion of the contest. After two earlier disallowed Minnesota Duluth goals, Richards opened the scoring at the 6:39 mark of the second period, but Providence’s Josh Wilkins followed less than five minutes later with a quick power play strike to knot the game at a goal per team. The momentum shifted for good, however, after the Friars failed to convert on a critical 5-on-3 power play as Leaman mentioned. With both Taylor Laderoute and Exell in the box, Providence had 1:18 of a two-man advantage to play with, but couldn’t convert despite several Grade-A chances against Bulldogs goaltender Hunter Shepard, as well as a crucial missed opportunity when Scott Conway elected to shoot in tight from the right circle instead of feeding a wide open Michael Callahan at the left dot. For those on the Friars side of the coin, they didn’t disagree. That was, seemingly, all the Bulldogs needed. They outshot the Friars 15 to nine, despite Providence being down for the latter part of the final frame. The momentum lost from the failure on the 5-on-3 power play was, perhaps, too much to overcome.